My last ride was fun, but then again, not so fun. It was fun because I was able to ride with my friends. As I mentioned though, I had a fall and ended up getting a bit scratched up. That day I didn’t feel so bad, but the next few days things went from bad to worse. My shoulder really started hurting me. My range of motion went way down and I realized I had taken a pretty bad fall and the adrenaline must have pushed me through the first day. That sore shoulder lasted for a couple days, and I only had to take Advil once, so the pain wasn’t anything crazy – just nagging. As soon as that pain went away though, I started feeling a little itchy spot on my left leg. 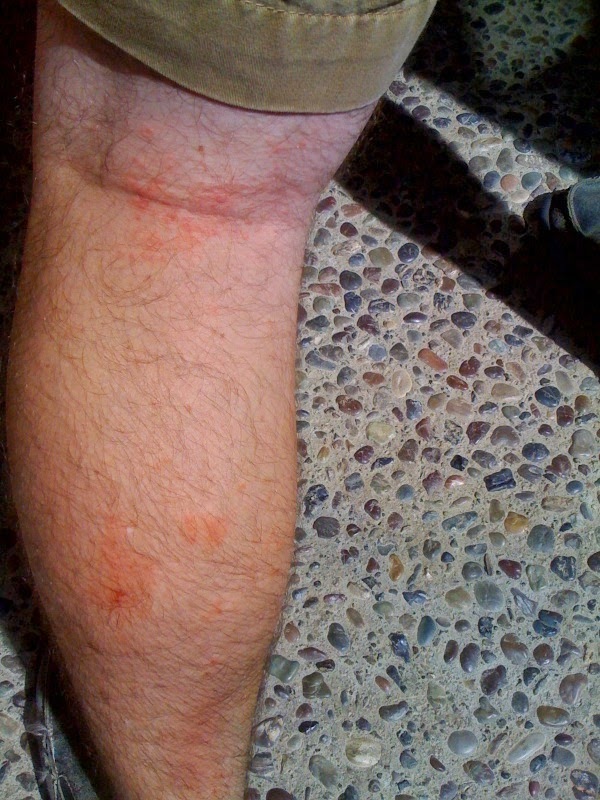 Then I remembered… I had seen some poison oak and as I whisked through a singletrack corner I remember thinking, ‘Hey, was that something that just nicked my leg?’ Yep. You can see above that the poison oak got me. I have never gotten poison oak at Fort Ord, only Hollister Hills. It seems it’s following me. I’m in the midst of fighting it off, and boy do I hate it. These last 10 months I’ve had it at least 8-10 times. It seems I can’t keep away from the stuff. Man, riding is brutal sometimes, but then again, not riding is worse. I just got a call from my bike shop – they have finished fine tuning my Stumpjumper, she’s ready to be picked up and shown some more attention.